Feast is a co-production between the Young Vic and the Royal Court Theatre, and its conception is as important as the final product itself. The Royal Court’s latest collaboration with Nigerian writers sparked an interest in Cuba, which in turn inspired similar intrigue about Brazil, the USA and England - all locations where descendants of enslaved Africans have established a thriving diaspora. Feast is showcased as part of the series World Stage London, with five emerging voices - Yunior Garcia Aguilera (Cuba), Rotimi Babatunde (Nigeria), Marcos Barbosa (Brazil), Tanya Barfield (USA) and Gbolahan Obisesan (UK) – all of whom must have had a daunting brief. The ambitious work they devised comprises of several concise vignettes that dramatize the journey made by millions of Africans from Africa to the Americas, in addition to the rituals, folklore and customs that crossed the Atlantic Ocean with them. Manifest throughout the Americas - most notably the Caribbean and South America - the play is about a resilient Yoruba worldview and its deep and lasting influence on people’s lives as well as the impact of this worldview on the emergence of several nations and cultures in the New World. The core belief of Yoruba people is that intangible but real traits and characteristics of our humanity - resilience, courage, nerves – are overseen by Supreme Being Oludumare and the Orishas or guiding spirits which help us navigate our existence. Seen in the folklore of Africa and the Americas it has its expression in syncretised religious and cultural practices such as Voudon, Santeria, Candomblé and similar belief systems throughout the hemisphere – often dismissed as voodoo, mumbo jumbo or witch doctorry – its living legacy negates any racist stereotypes. The story begins in 1713 when sisters Yemaya, Oshun and Oya - symbolising the Orishas of motherhood, beauty and the warrior spirit - are divided by a mischievous trickster [Louis Mahoney’s Papa Legba] and captured by slave traders. The trio are reincarnated in the subsequent centuries by versatile actors including Noma Dumezweni, Michelle Asante and Naana Agyei-Ampadu. The characters rely on courage, versatility and endurance – giving us in the process the perfect mix of effervescence, physicality and spirituality - qualities which set the trend for the entire 115 minutes of this show. Fusing drama, dance and perfectly intercut visual imagery, Lysander Ashton’s animation, photomontages, portraits, historical memorabilia and artefacts find their way onto Katrina Lindsay’s fantastically designed set and costumes. Partly raised in Nigeria - Rufus Norris’ dynamic direction personifies his own enthusiasm, intrigue and curiosity for a culture and history he also explored [alongside writer Gbolahan Obisesan] in his work on Wole Soyinka’s Death and The King’s Horseman. The performance moves effortlessly between West Africa, New York, Havana, Brazil and contemporary London punctuated seamlessly by the music of Michael Henry and Sola Akingbola [also playing Drumming Esu] with George Cespedes giving muscularity, grace and sensuousness to intricately choreographed dance and movement. In the final scene, the Babalawo who as the Chief Diviner of Yoruba people and who communicates with the Orishas - turns out to be white man speaking fluent Yoruba. This was a surprise but is shows how pervasive and deeply rooted the Yoruba culture is – and by extension the traits symbolised the Orishas. The confident and versatile 13 strong cast are outstanding with Daniel Cerqueira [White Man], Kobna Holdbrook-Smith [Elegba] and Louis Mahoney [Papa Legba] particularly charismatic. They are closely followed by Coral Messam [Dancing Oya] and Ira Mandela Siobhan [Dancing Elegbara]. Equally crucial are the three piece band silhouetted behind the set, but as important to Feast as the Antilabas band were to recent hit Fela! which also portrayed features of the same Yoruba culture. Where dialogue takes over from performance it is peppered with aphorisms and allusions to Yoruba customs, rituals and guidelines [confront the chaos of life, look to your inner self, be yourself, acknowledge your ancestors, look to the future]. And with this element the only weakness of the show is apparent with some intricacies – helpfully explained in the programme - overshadowed by the powerful visuals, physical theatre and design. 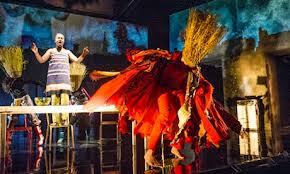 But in truth the playlets are just that – brief sketches filled in by the much more focussed dance and visual imagery. And it’s where the combined talents of writers, performers and dancers are shown to best effect.